300 episodes is a lot of TV. The list of shows that lived long enough to see such an illustrious milestone is not a long one. When you factor in shows that premiered in TV's most recent modern era that lasted long enough to do so, the list gets even shorter. And as Grey's Anatomy prepares to join the ranks of NCIS, Law & Order: SVU, and The Simpsons, its cast is wondering if they might be the last show to ever hit the lofty benchmark. As fellow OG star Chandra Wilson noted, the show, which debuted on ABC as a midseason replacement in the 2004-05 season, has managed to weather the many twists and turns that have rocked the TV industry, from the erosion of broadcast ratings due to cable's rise and the advent of time-shifted viewing to the disruptive arrival of streaming giants like Netflix and Hulu. "Firstly, when I see 300, I think history because that makes me really excited to be a part of television history. I see barriers being broken down. I see starting off when it was very necessary to be in front of the TV that night when it came on vs. DVR'ing it. Television viewing is so different today than it was. We've ridden all of those waves. There weren't box sets when we first started," she explained. "We just keep riding with every little wave that shows up. We're right in the middle of that. So I'm proud of us. We are the little engine that always could and can and will." Of course, just because they've managed to not only survive, but thrive for 300 episodes doesn't mean that everyone involved ever seriously imagined this day would come. "I remember, I started in the cast. I had just come here from Scotland, pretty new to town. My character started, and about four episodes into me starting, in season five, it was the 100th episode celebration," Kevin McKidd explained. "And I was like, 'How do you get to 100 episodes? How does that even happen?' In Britain, we do seasons of five episodes and that's it...So to stand here at 300, after that, it's unbelievable." 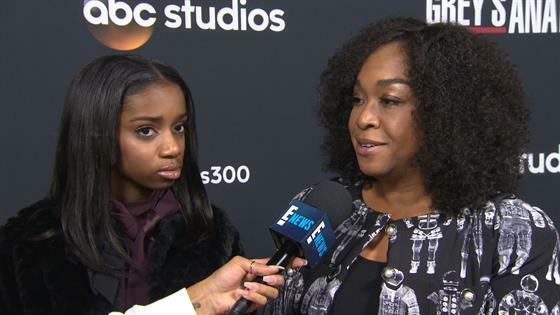 Creator Shonda Rhimes admitted that Grey's rare longevity all comes down to one thing: The fans. "I don't think I ever imagined we'd be here 300 episodes later. When we hit 100, I was shocked and surprised. When we hit 50, I was shocked and surprised," she said. "I'm continuously amazed at the fans and how into the show that they are and how loyal they've been. Even when they're mad, they're still there the next week to tell me how mad they are and how mad they're going to be next week. And I love that because that means they're passionate and they care." For more from the cast and crew, be sure to check out the video above! And for more on all things Grey's Anatomy in the lead up to the big 3-0-0, check back with E! News all week!